I mainly search Bradford, Sullivan and Wyoming Counties of Northeast Pa. Outside of these Counties is negotiable. I have been metal detecting for three years with my own machines. I would love to help you find your lost treasure! Tom is up for the challenge! "This isn't just a long shot, this is astronomical! But I am up for the challenge," Tom replied after I relayed the story of my lost wedding ring. The past weekend, I was on a 3-day 27 mile hike on Old Logger's Path in Loyalsock forest in north central Pennsylvania. 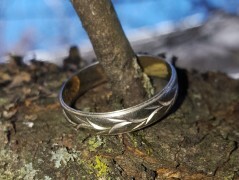 I usually remove my ring before the hike but didn't remember until I was already on the trail. Not having a zippered pocket of my own, I placed it in a small zippered section of my daughter's backpack. Not thinking much of it, when I finally got home - nearly 4 hours away - the zipper was half open and no ring to be found. I explained to Tom that my daughter, on her own, checked each day and saw the ring at our last camp site. So my GUESS was it was either there, at one of the two spots we stopped on the last day of the hike, or in the parking lot. But basically the ring was somewhere along 7 miles of trail covered by the fall leaves. I wrote up directions and information on the four spots we stopped and sent to Tom. Tom first asked me to get permission from the Loyolsock State Forest office of the PA DCNR and the ranger was happy to oblige after hearing my story. Friday of that week, Tom texted me a picture of the ring. It was in the parking lot (the first place he searched!). Tom sent me the ring via priority mail - just a few months ahead of our 20th wedding anniversary.